Achieving a perfect lawn isn't easy, and without the proper tools and knowledge, it can be nearly impossible. We offer premium lawn care service that are guaranteed to produce fast and noticeable improvements. We'll treat your lawn as if it's our own — let our expertise and years of experience make its mark on your lawn. Did you know that if you can't easily slide a shovel into your lawn, it's too hard to allow a sufficient amount of water and nutrients to be absorbed? Lawn aeration is a simple and highly effective method to reinvigorate your lawn. By puncturing small holes across the surface of your lawn, oxygen, water and other vital nutrients are given direct access to be absorbed by the roots of your lawn. Aeration reduces overpopulation, while also stimulating new, healthy growth. Aerating is a great solution for lawns experiencing die-outs, and is also vital before fertilizing and overseeding. We recommend having your lawn aerated at least once a year to achieve a thick and healthy lawn. Fertilizing is the process of broadcasting vital nutrients onto your lawn to promote health and growth. Grass craves nutrients that are often naturally insufficient in the soil to support a healthy lawn. Elements like nitrogen, calcium, phosphorous and carbon are quickly used up by a growing lawn, and if not infused back into the soil, can inhibit the health of your lawn. By applying concentrated fertilizers bi-annually, the soil is reinvigorated with the essential nutrients that support your lawn. When feritilizing, it is also very important to aerate the surface beforehand. By aerating your lawn and then applying a concentrated fertilizer, the nutrients are easily absorbed into the soil and given direct access to the roots of your lawn. Overseeding is a great way to make your lawn thicker, greener and overall healthier. Overseeding is the process of applying new seed over top of your existing lawn to promote further growth. This seed adds new life and increases the thickness and aesthetics of your lawn. With new overseeding applied annually, you will achieve your desired lawn in no time. When overseeding on a routine basis (ie. annually), it is also important to aerate your lawn. By combining aeration and overseeding, your lawn will rid itself of brown, burnt-out areas and revitalize it with healthy new growth. Sweeping is ideal in the springtime to remove the excess of old leaves, dirt and dead grass and allow new growth to prevail. This debris inhibits the vitality of your lawn and by removing it, the soil under your lawn is able to breath and produce healthy new growth. Sweeping is not harmful to your lawn and will only remove surface debris and areas of dead grass. We recommend sweeping/dethatching your lawn every spring to allow your lawn to properly recover from long Canadian winters. Our sweepers are engine driven, and pick-up and remove all of the debris. After this you will see your lawn take new growth and jump into a green, springtime state. Rolling is a simple and pain-free method to smooth out bumps and small imperfections in your lawn. Rollers are very heavy and have a very large, smooth surface area that pushes down on the ground to adjust the soil to a level state. Similar to an asphalt roller smoothing out a new road, a lawn roller creates a smooth surface underneath your lawn. Rolling is most effective in early-to-mid spring when the ground is still soft and somewhat spongy. This allows the roller to make a maximum impact on any imperfections. You can view our Pricing page to see our current prices for a variety of services. We offer a professional and affordable lawn care service that are guaranteed to improve the health and quality of your lawn. 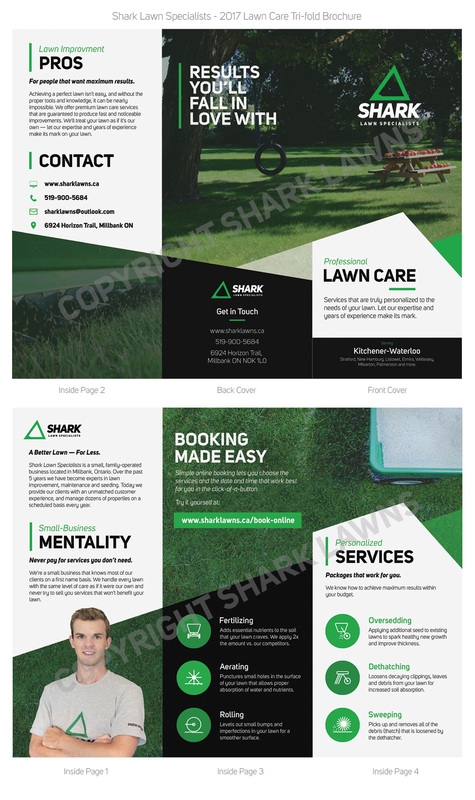 View our base pricing and packages for various lawn sizes on our Pricing page. Booking is now easier than ever. Book instantly online at a date and time that work for you (including weekends). Or call or text us at 519-900-5684.